Whether you’re having a “staycation” or visiting San Antonio from out of town, there are so many things to do during Spring Break week. The weather is warming up and the city is beckoning all residents and visitors outside to enjoy some of San Antonio’s exciting events and attractions. So what’s can you do this Spring Break 2016? 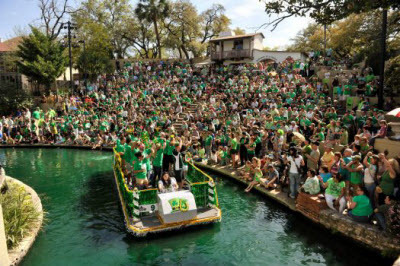 Attend the Murphy’s St. Patrick’s Day River Parade and Festival (March 13th). A family-friendly festival with music, food, and the famous “dyeing of the river”. The San Antonio River is dyed green each year in the spirit of the Irish! More info about times, events, and locations here. Take a River Boat Ride Down the San Antonio River. Fun for not only visitors, but for residents as well, the river boat tour is a must-do in Downtown San Antonio. Not only do you get to view the city from a different perspective, but the tour guides are highly educated on San Antonio history and provide so many neat facts about our city and its history. After the ride, enjoy lunch in one of the outdoor restaurants that line the riverwalk or head out to view one the United States’ most visited landmark: The Alamo! Test Your Mental Fortitude in “Extreme Escape”. This unique attraction provides a challenging experience for all ages that puts your mental and physical skills to the test. Teams are placed in rooms where they have one hour to find and apply clues in order to solve puzzles and escape before the clock runs out. Hit Some Balls at Top Golf. Now that the weather is feelin’ fine, it’s the perfect time to grab some friends and golf clubs and enter into a competitive game of Top Golf. Enjoy food, drinks and a fun night at the driving range. Once the sun sets, the lights come on and the range becomes one big light show! These events are sure to entertain both young and old! Do you have some favorite things to do during Spring Break? Share them with us in the comments below.